Technically speaking, it’s a free-standing building shaped like a dining car, a la the original Mickey’s in downtown St. Paul. Diners evolved from lunch wagons in the late 1800s, and the dining-car model caught on in the 1930s, when pre-fabricated diners began popping up, first on the East Coast and later around the country. Mickey’s opened in 1939. However, the spirit of the diner, which originally was intended to provide a cheap, quick meal for the masses, lives on in many neighborhood eateries. As places like Birdhouse on Hennepin, which owners Stewart and Heidi Woodman call their “finer diner,” and Kim Bartmann’s upcoming Tiny Diner, which will use produce from its own garden, begin to change, yet again, the scope of what a diner is, let’s revisit some of the classics. Here are a few of our favorite places to get a watery cup of joe and a hearty breakfast or standard patty melt in the east metro. Though the majority of these restaurants have been around for a long time, we did include the Daily Diner Frogtown. Even though it’s new and the food is somewhat evolved, the diner’s focus on feeding the neighborhood with mostly standard breakfast fare seemed to fit the bill. 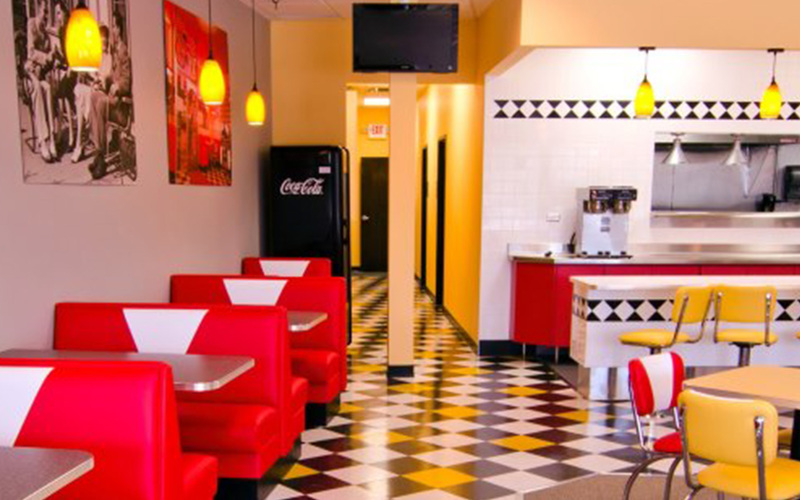 This squeaky-clean little storefront place next to an auto-parts store in Inver Grove Heights is decked out in decidedly new ’50s-style furniture, but it doesn’t necessarily lack in character. The decor is trying to be kitschy, and it is. An oddball mural in which St. Paul landmarks are painted side-by-side with the Leaning Tower of Pisa, the Egyptian pyramids and the Eiffel Tower is fun to analyze, especially with a snarky dining partner. Thankfully, the food is good. The M&M Sandwich Melt ($8.25), with caramelized, salty ham and buttery sourdough, is giant and tasty and comes with Cahill’s hash browns, which are a cut above many others.